Solomon Warriors dominated the fixture and were unfortunate not to walk away with all three points. Once again finishing failed them but scoring their first two goals in the competition will inject much needed reassurance to the players and their fans after a losing start to Amicale last weekend. Head coach, Brendan Chrichton, was a relieved man after the match but conceded that his team should have won the game. “I really feel like we were the better team on the field today and if this were a boxing match I think we’d have won given our performance. We controlled much of the game but we missed our some of our chances to score,” Chrichton says but adds that the win means much to his club. Ba coach, Yogendra Dutt, was philosophical about how his team allowed Solomon Warriors to get back in the game and deny them what would have been invaluable away win. “When we cannot win away the best result we can hope for is a draw and today we are pleased to earn this point against Solomon Warriors. Today was a difficult game against our opponents because they were determined to get a win and really put us under pressure,” says Dutt. After a crushing loss to Amicale, Solomon Warriors were asking questions about their preparations and the match needed to be a statement to their fans but mostly to the team itself. Ba, who had tucked an away win against Hekari United last weekend did not have the urgency for a win as did their opponents. The match opened to a fierce tempo as Ba came out with all guns blazing and it took them only five minutes to register on the scoreboard. A free kick which earned Brian Kaltack a yellow card gave Ba the opportunity for a set-piece move and Nigerian Sanni Issa finished with a header. Issa doubled his tally for the day in the 20th minute when a confused Solomon Warriors defence allowed him to pick up a loose ball just outside the penalty box and curl it past Eddie Newman in goal. Twelve minutes later Kidston Billy scored for the home side following another case of indecision by defenders, this time it was the Ba backline who faltered. Jeffery Bule gathered a poor clearance and after dazzling the Ba defenders with some fancy footwork he slid in a pass to Billy who tapped the ball past the advancing Ratu Jone. The two sides then played out a goalless spell that lasted a whole hour. Ba tried to muster up a buffer goal but the Solomon Warriors backline was stubborn even though it was shaky at times and almost gave way again to pressure from Issa who continuously pestered them. A moment of controversy came into the game in the 73rd minute when Ba had a goal cancelled much to the displeasure of their bench. The second assistant referee ruled that the ball had already crossed the touchline before it was kicked into the Solomon Warriors goal. Play was halted as the match officials sorted out the situation and the match restarted from a corner kick. However, the moment that gave the home crowd a reason to leap from their seats did not come until regulation time was already up. As stoppage time was indicated hope was fading and several fans were already walking out of the stadium. However, Solomon Warriors had no intention of throwing in the towel and luck fell to them when Jone made a poor clearance outside his penalty box which ended up with Micah Lea’alafa who was more than happy to send the ball into the empty Ba goalmouth. 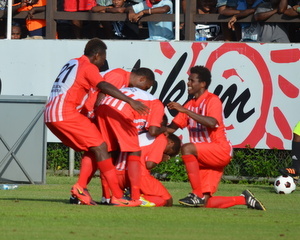 Solomon Warriors will play Amicale at Port Vila stadium, Vanuatu, in their next match which is scheduled for April 13 and Ba will play Hekari United at home on the same day. This will be followed by the clubs’ (Solomon Warriors and Ba) second meeting of the competition on April 17 at Govind Park in Fiji.